Whatever the surface at Santa Anita, dirt or artificial, the locals have an advantage over all comers, especially the East Coast runners. It’s been a long time since the Breeders’ Cup was held on the East Coast. Monmouth Park was the last East Coast track to host the Cup, and that was in 2007. In 2005 Belmont Park hosted the Cup, which was the last time the event was in New York. It’s been even longer since an East coast horse won a Breeders’ Cup race on the main track at Santa Anita. It’s been just as long since a horse made its last start on a New York main track and followed that with a Breeders’ Cup win on the main track at Santa Anita. In 1986 Lady’s Secret won at Belmont and then won the Distaff at Santa Anita. The East Coast based Smile also took the Sprint that year. Since then, it’s been a lost cause for the East and New York’s main track runners when they head for the Cup at Santa Anita. Those recording Breeders’ Cup victories on the main track at Santa Anita have won on dirt and, in 2008 and 2009, won on the artificial surface (This year Santa Anita offers a traditional dirt surface). On either surface the nod goes to those based in Southern California. The Europeans have recorded some winners on the Arcadia main and there have been a few from mid-America. Whatever the surface at Santa Anita, dirt or artificial, the locals have an advantage over all comers, especially the East Coast runners. Most patrons at a track play the game by examining data on paper and then make a bet. It’s like reading a brief news report in the newspaper and accepting the information as the entire story. And, most handicappers that play the game look at the numbers and a small amount of other numerical data and then they make a decision. Little thought is given to the other evidence. 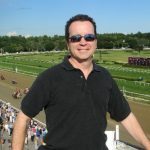 “We have a tendency to think of these animals as machines, but they are living, breathing creatures, subject to the laws of nature,” said Jude Feld, former Southern California trainer and now a commentator on the Horse Racing Radio Network (HRRN). The thoroughbreds are not machines and the people that handle them are imperfect because they are human. That really throws a monkey wrench into any analysis, especially for those that don’t believe horse playing is truly a game of skill. As far as travel is concerned it is much harder to travel east to west. Many people claim this is true in other sports such as baseball and football. “The human and equine genome is relatively close. Light regulates clock genes, so it would behoove trainers to get their runners out in the light as much as possible in their first few days. Early shipping would also aid their cause,” Feld explained. Usually the weather has plenty to do with racing and most of us first think of rain and wet tracks. But when the Breeders’ Cup heads west there are other meteorological considerations. Feld explained the most important weather factor to consider the first Saturday in November. “Fall has definitely hit the Midwest and East Coast, yet it is much warmer in Southern California [than usual]. Eastern horses will have been growing winter coats and adjusting to cool weather (30s in the morning back east) and are suddenly thrust back into summer.” Readjusting to the weather is also another reason for shipping early. This year give more thought to the other factors in thoroughbred racing, not just the printed numbers and the name of the jockey. Remember, horse playing is an art and a game of skill. It is not for those that guzzle free casino drinks and pull the handle of a slot machine watching their money disappear. AGameofSkill.com is tracking the horses that appear to be working well for the upcoming Breeders’ Cup at Santa Anita, Nov. 2-3. Although many top horses can work well but fail to reproduce that form in the afternoon, watching runners that are training impressively can still provide handicappers with a significant edge come race day. Keep an eye on this horses on the big weekend: Animal Kingdom. It’s not every day that you get to “ride” a Kentucky Derby winner but this head cam puts you in on the action. Skip to the 3 minute mark if you’re short on time. The work is from Oct. 10 and there are two horses way ahead of him on the rail that he is targeting. ADW Offer: Get cash back on your Breeders’ Cup bets – plus a signup bonus when you join. Visit Premier Turf Club and enter promo code “AGOS” for a bonus offer. The Horseplayers Association of North America has released their Annual Racetrack Ratings. In 2012, for the fourth consecutive year, Keeneland is the number one rated thoroughbred racetrack in North America. Keeneland opens this Friday, April 6th in Lexington, KY.
Players interested in attacking the upcoming Keeneland meet should give a serious look to Art Parker’s “Keeneland Winning Trainer Patterns – 2012 spring meet edition” which profiles the 79 trainers who have had 2 or more winners over the past four meets. Visit our handicapping books to learn more and download today. The Kentucky Wildcats have been sitting on the door of destiny for the past three seasons. Two years ago the team led by superstar guard John Wall was ripping through the 2010 NCAA brackets when they got derailed in the Elite 8 by a scrappy squad from West Virginia coached by Bob Huggins. The final score 73-66 as the Mountaineers upset a Kentucky team that was 35-2 on the season. Then, last season, a “new” Kentucky Wildcats team kept getting better and better as the year went long. Like the season before, they were dismantling teams in each round of the tournament until they were paired against the UCONN Huskies in the Final Four semifinals. Everyone with some level of basketball knowledge knew that this game was the real championship, as the winner appeared superior to Butler in the next game. A red-hot UCONN team pulled the mild but thrilling upset, defeating the Wildcats 56 to 55. Fast forward another year and the Kentucky Wildcats are two games away from their first NCAA National Championship since 1998. Loaded top to bottom with five-star recruits and future first-round NBA draft picks, Kentucky simply looks too good for any of the three remaining teams – Louisville, Ohio State and Kansas. No team matches up with them at ANY position. Their five starters are better than whoever has to guard them in their next game. The results – both Saturday and Monday – look inevitable. So how could a team that lost to the Providence Friars by the jaw-dropping score of 90-59 have any chance against one of the finest teams we’ve seen in years? How could a team that loses to them nearly every year on New Year’s Eve have much of a fighting chance? There are no less than 17 reasons why the Louisville Cardinals not only have a chance on Saturday evening but will “shock the world” with a huge upset of the overall #1 seed. Reason #17: DEFENSE – The Louisville Cardinals have one of the best, if not the best, defense in the nation. Just ask the Florida Gators (possibly the hottest shooting team in the tournament) what happened when Louisville adjusted from a zone defense to man-to-man. Ask Draymond Green’s Michigan State who were held to 44 points in the third round, their lowest scoring total in the history of the tournament and one of the lowest scores ever by a team in the March tournament. Reason #16: COACHING – Coach Cal is an excellent coach but a better recruiter. Everyone knows that when you give Rick Pitino time to prepare for a game, there is no one more dangerous in the game. That’s why he is 10-0 in Sweet Sixteen games lifetime. He is also undefeated in season rematches against Calipari, including 3-0 in post season play. To make matters worse, Coach Cal also has a history of losing tight games. Just ask the 2008 Memphis Tigers. Or last year’s Wildcats. Reason #15: PRESSURE – The Kentucky Wildcats are playing with the weight of the Bluegrass State on their shoulders. They are expected to win, usually by a large margin. And a loss to the Cardinals would not just be any loss. It would be devastating to the Big Blue faithful. 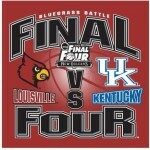 The Louisville Cardinals are not expected to win. Has anyone noticed how loose and amicable Rick Pitino has been over the past 2 weeks? We haven’t seen Pitino like this in years. Reason #14: HUNGRY – The Louisville Cardinals are hungry for this win. They are not getting any respect despite winning the Big East tournament in impressive fashion, dismantling the likes of Michigan State, and reaching the Final Four on an eight-game winning streak. Reason #13: BIG EAST DOMINANCE -Most college basketball fans agree that the Big East is the toughest conference in the land. It’s no coincidence then that UK has lost to Big East teams each of the last two years in the tournament. A loss to Louisville would extend that streak to three years. Reason #12: TEAM UNITY – The Louisville Cardinals are playing like a fine tuned machine. There are no egos on this team. The players are unselfish, and when coupled with the coaching staff and leadership of Rick Pitino, that makes for a very dangerous unit. That’s why they are two games away from a National Championship title. Reason #11: NO FLUKE – Louisville was ranked pre-season #4 in the entire country. The experts realized the talent this team had and the potential for a great season. The fact they are heading to New Orleans is no fluke. Reason #10: HEALTH – The Cardinals have been banged up all season. They lost key players when Rakeem Buckles, Stephan Van Treese, Mike Mara, and top recruit Wayne Blackshear all went down to injury. Only Blackshear has returned and he is a minor player in the overall scheme for the Cardinals. When Louisville played UK back on December 31, they were not a healthy team. Yet they only lost by 7 points in Rupp Arena, a place when UK has won 51 games in a row and never lost under Coach Cal. Reason #9: NEUTRAL COURT – UK got to play the first two games of the NCAA tournament at the Yum Center in front of a home crowd. Then they traveled to CATlanta, where again they got to take the court in front of stands covered in a sea of blue. They now have to share the Superdome with fans of three other schools that also travel very well. The home court edge is over for Kentucky. Reason #8: UNDERDOG – Louisville has relished the underdog role. Pitino loves being the underdog. This team has a chip on their shoulder as they take on the “older” brother. Reason #7: EXPERIENCE – Senior, Junior, Senior, Sophomore, Freshman. That is the starting lineup of the Louisville Cardinals. Contrast that with UK which plays a six-man rotation, three of whom are freshman and only one, senior Darrius Miller, has been around more than two years. Reason #6: DEPTH – Speaking of the six-man rotation used by Calipari, Kentucky lacks any depth. Louisville can bring any number of guys off the bench – quality players like Jared Swopshire, Wayne Blackshear and Russ Smith. UK fans remember Smith well, as he put up 30 on the Cats on Dec. 31. Reason #5: RESILIENCY – What makes tennis star Rafael Nadal so difficult to beat? Besides his crazy talent, it is the fact he never gives up. He gets balls other players don’t get. If he is down love-40 in a game, he comes back and wins it. The Louisville Cardinals demonstrated a similar level of resiliency in their game against the Florida Gators. Down double digits and in serious foul trouble with eight minutes to go, the Louisville defense shut down the red-hot Gators and, in a flash, were back in the game. Just as the comeback was commencing, star point guard Peyton Siva fouled out. But that didn’t deter the Cardinals. They won by four in a phenomenal comeback based on the dynamics of this game. Reason #4: FAMILIARITY – The Cardinals have already seen the Wildcats this year, losing to them by seven points in hostile Rupp Arena on New Year’s Eve in front of a national TV audience. Ask the New York Giants if playing the New England Patriots during the 2011 NFL season (or the 2008 season for that matter) was an advantage to them. The losing team learns a lot more from the loss, than the winning team does from the victory. Reason #3: LUKE HANCOCK – Who? Very few people outside hard-core Louisville fans realize that one of the best players on the team has been red-shirting all season long. The 6′ 6″ Hancock transferred from George Mason to Louisville last season but was forced to sit out the year. In two years at George Mason, Hancock was a star, hitting over 49% of his field goal attempts and leading George Mason to a thrilling upset win over highly ranked Villanova in last year’s NCAA tournament. Last year UK had the benefit of Enes Kanter (now a member of the Utah Jazz) participating in the daily workouts. This year, Louisville has the benefit of a top notch player who can play the opponent’s role in pre-game practices. Reason #2: INTANGIBLES. Unwavering confidence. Intelligence. Senior leadership. Heart. Sometimes you just can’t quantify why a team is winning the way they are, except for intangibles. THE RIVALRY. There is nothing more dangerous in sports to a heavy favorite than meeting one their hated rivals in a game they are expected to win. This is one of the biggest rivalries in the history of all sports. It’s the Red Sox – Yankees. The Celtics – Lakers. The Bears – Packers. It’s college basketball rivalries at it’s best. 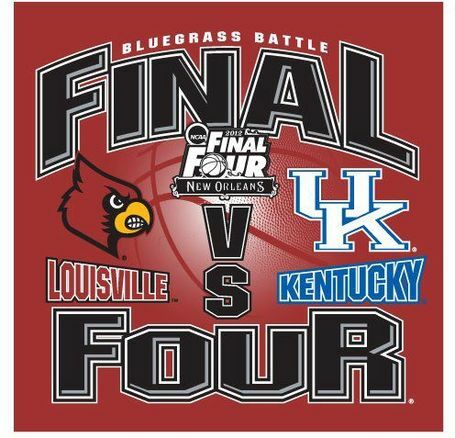 Louisville fans are salivating at the chance of knocking off Kentucky in this Final Four game. Kentucky fans are praying that the dream of New Orleans doesn’t become a nightmare. The fact is the Louisville Cardinals are not intimidated by their rival from 80 miles up the road. They remember well the loss from three months ago. The Wildcats, on the other hand, may only recall a shadow of the team they will face on Saturday night. Visit our Future Book odds page for the complete list. Gulfstream Park in Hallandale Beach, Florida will host the 14th running of the Claiming Crown on the opening day of its 2012-2013 meet, Saturday, December 1, 2012. The 2012 event will see a significant increase in purses to $850,000 for seven races with the individual race purses ranging from $100,000 to $200,000. In addition to the six Claiming Crown races conducted at the 2011 event, the Tiara for fillies and mares on the turf will return this year. Winning at the Races. It doesn’t get any better than this. So why is horse racing so much more exciting than other forms of gambling? Why is the typical horseplayer not some degenerate low life, but very often a well educated person or professional businessman or woman? Take a gander at political consultant Michael Beychok winning the 2012 National Handicapping Championship (NHC) in Las Vegas. Here was the scenario. After nearly two full days of selecting horses against nearly 500 other players, Beychok was in second place, $11.00 behind the leader. The last race of the day on Saturday, January 28 was the finale at Golden Gate Fields in San Francisco, and Beychok used his last optional play on a 3-1 shot in that race. The horse got up by a nose and paid $8.20 to Win and $3.80 to Place, for a grand total of $12.00. The previous leader, Dave Flanzbaum, used a 9-1 shot in the same race who ran a close third. Flanzbaum lost by both a nose on the racetrack and in the contest. He won $150,000 for second and $5,000 in additional prize winnings for having the day two leading bankroll. Michael Beychok became the first ever winner of one million dollars in a horse racing handicapping tournament! In 13 years the National Handicapping Championship (NHC) has grown from a grand prize of $100,000 to ten times that amount. Qualifying events are held throughout the country as well as online. Entry fees for those events range from free to $10,000, but the majority are usually about $100. This year’s championship event was held for the first time at Treasure Island resort in Las Vegas. Several years ago the event was televised on ESPN. This year racing will need to rely on social media and word of mouth to deliver the message about Beychok’s sensational victory at the NHC. A 48-year-old political consultant from Baton Rouge, La., Michael Beychok became the first ever millionaire winner of a horse racing handicapping tournament by winning the 13th annual Daily Racing Form/NTRA National Handicapping Championship (NHC). He did so in dramatic fashion in the final race of the contest Saturday to claim the $1 million first-place prize and an Eclipse Award as Handicapper of the Year. Beychok finished with a final score of $238.60 to rally past Dave Flanzbaum, 45, of Rolling Meadows, Ill., who finished with $237.60 after leading most of the final hours of the day.